ARGAN & SHEA BUTTER+ COCONUT & JOJOBA OIL, BEARD SOAP, Beard Cleanse & Shampoo, Trim Soap. 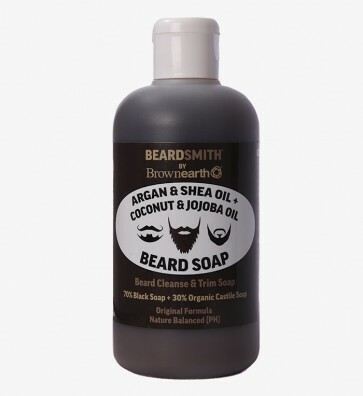 Aqua, Potassium Oleate, Potassium Cocoate, Glycerin, Potassium Citrate, Citric Acid, Aqua (water), Shea butter (Butyrospermum Parkii), Copra Oil (Coconut Oil), Palm Kernel Oil, Cocoa Pod Ash (Theobroma Cacao Pod).Argania Spinosa (Argan) Oil, Prunus Amygdalus Dulcis (Sweet Almond) Oil, Ricinus Communis (Castor) Oil, Simmondsia Chinensis (Jojoba) Seed Oil. Citrus aunrantifolia (Lime) Oil. You're reviewing: ARGAN & SHEA BUTTER+ COCONUT & JOJOBA OIL, BEARD SOAP, Beard Cleanse & Shampoo, Trim Soap.